The layout of any office is an important aspect of the productivity and culture of a business. Depending on the type of business being conducted, different office design ideas can benefit certain work environments. Many believe that an open office design floor plan can open the employees up to greater collaboration and creativity, though the peace and quiet of a private office may work for others. Here are some things to consider with both types of floor plans. 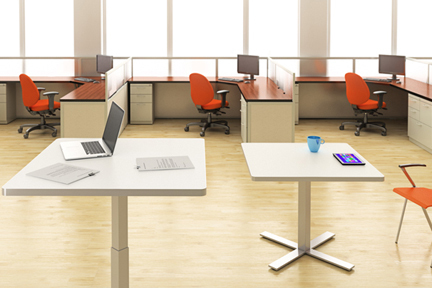 There are some advantages for businesses that choose to have open layouts in their offices. One of the biggest benefits to this is employee collaboration. For businesses that innovate and do a lot of brainstorming, it is much easier to bounce ideas around and approach all levels of employees when there is an open floor plan. Some employees with great ideas may be intimidated when they have to go to a private office and knock on the door to share their next great idea. Businesses that are constantly creating get the most benefit from an open floor plan at the office. The downside to open office layouts is that employees can experience more interruptions and lower levels of concentration because of a lack of physical barriers between employees. Additionally, noise is a common complaint in open office layouts, which can reduce productivity and performance. There can be advantages to having a private office over space in an open floor plan. For many employees, it allows all of the distractions to be shut out once the door is closed. Employees will not have to deal with other conversations, phones ringing or other types of sights and sounds that could be pulling them away from their work. Another benefit of a private office layout is the amount of space it provides. Working in an open environment may provide a cubicle or small desk space, with other work spaces being shared by the whole staff. With a private office, you can have your own desk, shelves and filing cabinets to yourself. This works well for employees in industries who manage a set of clients or have tons of paperwork to manage on a daily basis. The final benefit of a private office is that it can provide an atmosphere of status to employees who are provided that type of space. Typically, those in a position of authority will get an office or a larger office through promotions. It is a status symbol that has been in the business world for centuries, and many employees still use it as a major career milestone. Industries where climbing the ladder is essential would benefit the most from these office design ideas.